In this landmark biography of Winston Churchill based on extensive new material, the true genius of the man, statesman and leader can finally be fully seen and understood--by the bestselling, award-winning author of Napoleon and The Storm of War. When we seek an example of great leaders with unalloyed courage, the person who comes to mind is Winston Churchill: the iconic, visionary war leader immune from the consensus of the day, who stood firmly for his beliefs when everyone doubted him. But how did young Winston become Churchill? What gave him the strength to take on the superior force of Nazi Germany when bombs rained on London and so many others had caved? In Churchill, Andrew Roberts gives readers the full and definitive Winston Churchill, from birth to lasting legacy, as personally revealing as it is compulsively readable. Roberts gained exclusive access to extensive new material: transcripts of War Cabinet meetings, diaries, letters and unpublished memoirs from Churchill's contemporaries. The Royal Family permitted Roberts--in a first for a Churchill biographer--to read the detailed notes taken by King George VI in his diary after his weekly meetings with Churchill during World War II. This treasure trove of access allows Roberts to understand the man in revelatory new ways, and to identify the hidden forces fueling Churchill's legendary drive. We think of Churchill as a hero who saved civilization from the evils of Nazism and warned of the grave crimes of Soviet communism, but Roberts's masterwork reveals that he has as much to teach us about the challenges leaders face today--and the fundamental values of courage, tenacity, leadership and moral conviction. Andrew Roberts is the bestselling author of The Storm of War: A New History of the Second World War, Masters and Commanders: How Four Titans Won the War in the West, 1941-1945, Waterloo: Napoleon's Last Gamble and Napoleon: A Life, winner of the Los Angeles Times Book Prize for biography and a finalist for the Plutarch Award. He has won many other prizes, including the Wolfson History Prize and the Brit­ish Army Military Book of the Year, and frequently writes for The Wall Street Journal. He lives in Lon­don and often lectures in New York. "The best single-volume biography of Churchill yet written. . . . Roberts tells this story with great authority and not a little panache. He writes elegantly, with enjoyable flashes of tartness, and is in complete command both of his sources and the vast historiography." "Terrific . . . By drawing on many previously untapped sources, Mr. Roberts has produced a more complete picture of his subject than any previous biography." "Even if you’ve read every other book about the former prime minister and seen all the movies, expect revelations. For example: The royal family permitted the author to read King George VI’s diary notes about his wartime meetings with Churchill. That’s a first." "Brilliant, breathtaking, unputdownable . . . the definitive picture of our greatest political leader. All Roberts's past life has been but a preparation for this hour and this work, and this brilliant book is a fitting crown to his own career." "Roberts’ new biography (★★★★ out of four) stands tall, re-illuminating the well-etched contours of Churchill’s monumental life with scrupulous scholarship and a flair for unearthing the telling detail; looking twice where most biographers have been content to glance once." "In this season of giving, get (and give) Andrew Roberts’s brilliant new biography. . . . A review last month in The Times called it 'the best single-volume biography of Churchill yet written,' but it’s more than that. It’s an antidote to the reigning conceits, self-deceptions, half-truths and clichés of our day." "The best biography of Winston ever written . . . bursts with character, humour and incident on almost every page." "Fantastically readable prose, which flows along in a pitch-perfect combination of erudition and eloquence . . . In brightly engaging chapters, Roberts takes readers through all the stages of Churchill's adventurous life as a soldier of the empire and then as a professional politician . . . Roberts is a shrewd and experienced biographer." "A tour de force of scrupulous selection and astute appraisal, perhaps the best full-scale biography to date in a field where the competition has been crowded and stiff." "A stupendous achievement: lucid, erudite, intelligent, but also inspiring. Roberts catches the imperishable grandeur of Churchill's life as no other historian has done. Roberts does full justice to Churchill’s superhuman range of activity." "The best single-volume life imaginable of a man whose life it would seem technically impossible to get into a single volume." "Roberts brilliantly conjures up one of the most fascinating characters of all time. He enriches the saga with wonderful examples of Churchill's aristocratic eccentricities, glittering oratory and wit." "It’s the sort of biography that, one feels, Churchill himself would have wanted: colossal, energetic, deeply knowledgeable, properly critical, but also sympathetic and, in places, deliciously funny." "Roberts is a master storyteller." "[Roberts's] research is outstanding, based on archival and primary sources . . . What emerges in Roberts' book is a man full of complexities. . . . Roberts' book is full of insights and facts that provide a deeper understanding of Churchill." "This definitive biography of the storied leader was made possible through unprecedented access to material, including diaries, letters, unpublished memoirs and even the detailed diary notes taken by King George VI." "Terrific . . . Churchill probably lived the most variegated life of any political figure of the 20th century. Moreover, he was obnoxious, charming, emotional, selfish and patriotic. Roberts has captured his complexity in a way that few historians have ever imagined." "Roberts’s brilliant new book is not only learned and sagacious but also thrilling and fun. An award-winning historian and biographer, an expert on statecraft, leadership, and the Second World War, Roberts writes with authority and confidence. Enriched by such previously unseen material as King George VI’s wartime diaries, [Churchill] should stand as the definitive one-volume Churchill biography." "Andrew Roberts has written the best single-volume biography of Winston Churchill to date." "Widely praised as the best single-volume biography of Winston Churchill ever written, historian and commentator Roberts draws on previously unavailable journals and notes for the robust, engrossing, and nuanced history of the great British leader." "Roberts writes gripping narrative history without deserting high scholarly standards. . . . Surely the last word for years to come on Churchill." "Like all of Andrew Roberts’s histories, Churchill is massively researched and exquisitely written. The author’s sharp sense of humor is often in evidence and warmly complements Churchill’s own. This is a brilliant work, by a very fine historian, on a permanently heroic and always fascinating figure." "Wonderful, masterly . . . There have been few lives as long, momentous, and wide-ranging as that of Sir Winston Churchill, author, adventurer, orator, wit, painter, animal lover, friend, and politician. Andrew Roberts’s masterful, supremely readable biography has a text 982 pages long. It could hardly have been shorter and told so extraordinary a story so well." "The most superb one-volume biography I have ever read—of anyone. . . . Roberts also manages something I thought impossible. He has given us a new, ground-breaking portrait of the man whom many consider to be the greatest ever Englishman. . . . Roberts’s brilliance as a biographer was clear from his very first, of Lord Halifax. Re-reading it in tandem with this magnificent Churchill, one sees yet again just how finely history turns on random and uncertain events. . . . This is a simply wonderful book. A living, poetic, stirring yet thought-provoking portrait of a giant, it will be regarded as a classic for generations to come." "Terrific. . . . [Roberts] is one of the great historians of his generation and he is stupendously readable. . . . Andrew Roberts has captured [Churchill’s] complexity in a way that few historians have ever imagined." 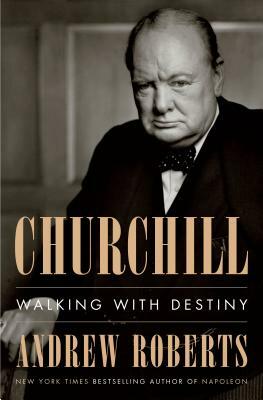 "In my opinion, the book, Churchill: Walking with Destiny, is the most precious gift of the year 2018—in history, education, knowledge, and literature. . . . If there were a Nobel Prize for historical research, Andrew Roberts would be a perfect candidate." "A page-turner . . . full of new material that has not been previously available to Churchill scholars. Roberts manages to mobilize these tremendous sources into a well-paced narrative that is full of exciting passages—which matches perfectly the venturesome spirit of Winston Churchill." "A complex and compelling depiction of one of the most important political leaders of the 20th century, one sure to enlighten and provoke both those familiar with Churchill and those who may know little beyond . . . a tour de force. Roberts has given us a great gift. He presents a Churchill in all of his complexity. What makes this book essential for those who care about reviving and defending liberal democracy in our time is that it reminds us that, even at moments when old hatreds burn bright and few are willing to swim against the current, it is still possible for great leaders to emerge." "I didn’t think we really needed a new Churchill biography, or, having read so many, that I would find a new one catching up my attention, but Roberts proved me wrong. In addition to new source material, Roberts’s judgments about Churchill, and his keen selection of the most salient details about Churchill thought and action, are superb." "A magnificent and carefully nuanced life and times of Winston Churchill, elegantly written, studded with new research, and deeply imagined. Andrew Roberts accomplishes a minor miracle in offering a fresh, empathetic portrait in an authoritative and fast-paced narrative that never flags. Roberts explores Winston Churchill’s strengths and weaknesses as a leader, his self-centeredness and his generosity, allowing us to feel both Churchill’s personal vulnerabilities as well as his force as a public figure." "A heroic biography, appropriately matched to the ambition, egotism, and undoubted achievement of the life it describes. It will surely remain the outstanding Churchill biography for many years to come." "The newly definitive one-volume biography of its subject . . . Andrew Roberts has brilliantly reconstructed the life of a titanic figure of the twentieth century within the intellectual context of his times. As such, Churchill constitutes a first-rate, authentic work of historical scholarship for our time." "Riveting . . . A masterful biography, rich in detail and insight." "A well-researched and exceptionally well-written biography . . . This compelling book is likely to become a standard text on Churchill and will be difficult to keep on the shelves." "This biography is exhaustively researched, beautifully written and paced, deeply admiring but not hagiographic, and empathic and balanced in its judgments—a magnificent achievement." "A clear, well-limned view of a complex figure who, in no danger of being forgotten, continues to inspire. The most comprehensive single-volume biography of Churchill that we have in print and a boon for any student of the statesman and his times."